In this collection about life as a twenty-something in the twenty-first century, Kathleen Rooney writes with the finesse of someone well beyond her years, but with fresh insights that reveal a girl still making discoveries at every turn. Varied and original, the tales in For You, For You I Am Trilling These Songs recount the perils of falling in love with the unlikeliest of people, of visiting the New York apartments of a vanished poet, and of touring an animal retirement home with her parents. Of getting a Brazilian wax, and of chauffeuring a U.S. Senator around town. Of saying good-bye to a cousin who’s joining a convent, and of trying to convince herself that she’s not wasting her life. This is a book about love and longing, poetry and plagiarism, death and democracy, mountain floods and midwestern cicadas. Here is a young woman struggling to find her place as an adult and a citizen in an America that rarely manages to live up to Whitman’s dream of it. 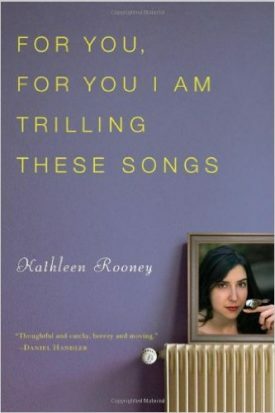 Time Out Chicago heralded Rooney as Chicago’s “brightest unsung literary star,” and with this book, she sings—yes, in fact, she trills—loud and clear.